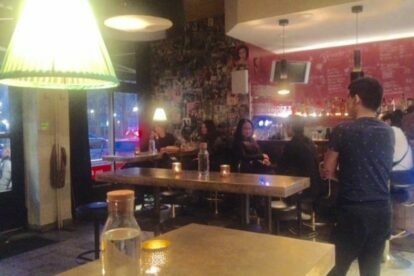 You’ll might get the feeling that Elefantpojken is more of a hangout bar than a primarily Asian cuisine restaurant. Its walls are covered in poster collages, the toilets are full of graffiti, and thirsty regulars are crowding at the counter. The fact is that this local nest is a brilliant stop for both thirsty as well as hungry “SoFo”-strollers. I love going here on weekdays at about 17:00, and with a pre-dinner beer in hand, watch the first early dinner guests arrive before I make my own order. The diner part is in the back, but I always prefer to stay in the front room. Here, the lightning’s much cozier, the atmosphere relaxed yet vivid – and the beer taps close at hand. Every dish comes in half or whole portions, and every single dish can be made vegetarian as well. Despite the generous prices and tasty food, the staff is friendly and relaxed. Elefantpojken is unpretentious yet never careless, and everyone’s welcome here no matter age or type. That includes your dog (no joke).